Those nice folks over at Buitoni are coming out with a new line of all natural Riserva pasta which they made available to some of the Foodbuzz bloggers. They shipped me a cooler box containing a package of the new Wild Mushroom Agnolotti variety. They also challenged us to come up with an original sauce to compliment this delicious pasta. Rick and I mulled over a few flavours and came up with the idea of using Manchego in a cheese sauce. I know Manchego is a Spanish cheese but fusion seems to be what’s happening in my kitchen lately anyway. I decided to make a Mornay sauce (which is basically a Bechamel with cheese and a bit of seasoning added) and top it off with some toasted pine nuts (pignoli), some diced sun dried tomatoes and a bit of Italian flat leaf parsley. I have to say the combination of flavours with the mushroom pasta was OMG delicious! Here’s the recipe I hope you try it and the other new Buitoni Riserva All Natural Fresh Pastas– varieties include: Quattro Formaggi Agnolotti, Wild Mushroom Agnolotti, Chicken & Four Cheese Ravioli and Braised Beef Sausage Ravioli. Heat the milk with the bay leaves until just coming to the boil. I do this in a 2 cup Pyrex glass measuring cup in the microwave for ease. In a medium heavy bottomed (preferably copper clad) sauce pan heat the butter until melted and bubbling. Add the flour and season salt and stir until a paste forms. Remove the bay leaves from the hot milk and add the milk to the flour paste in the sauce pan. Stir constantly with a whisk until slightly thickened. Mix the egg yolk with the half and half and add to the mixture in the pan stirring as you add to incorporate it without making scrambled eggs. Cook until thickened. Remove from the heat and add the Sherry- stir in. Use for Mornay sauce that follows. Mix the cheese and other ingredients into the hot Bechamel and stir until melted. 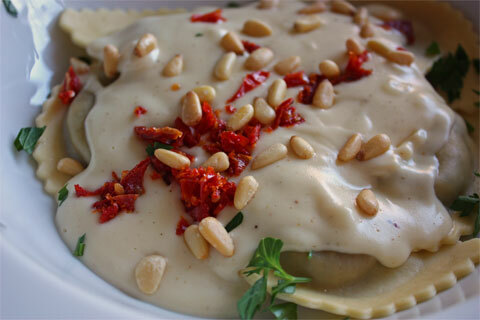 Serve immediately over Buitoni Wild Mushroom Agnolotti. Toast the pine nuts in a pie plate in a 350F oven for a few minutes just until golden. Drain the sun dried tomatoes on a paper towel to remove the oil they come in and then dice them. Place the cooked Agnolotti into deep plates ( we used six per person) top with the Manchego Mornay Sauce, toasted pine nuts, tomatoes and parsley. Enjoy! This entry was posted in Fun Stuff, Main Dishes, Pasta, Recipes and tagged Buitoni, Manchego, Mornay, Pasta, Wild Mushroom Agnolotti. My Gabi, Your sauce looks wicked good! Yumm! Love your sauce and I am sure it paired just perfectly with the mushroom flavors. it might be hard for me to pronounce it, but i’d sure like to eat it!!! it looks AB FAB!!!!! i love to see that you are still doing amazing things in that kitchen of yours with that hubby of yours. The pasta was great, wasn’t it? I used goat cheese in my sauce. Really like the idea of your recipe. Your pasta dish looks great, Gabi! I think that Buitoni’s products are pretty good, so I’m looking forward to trying these new ones. 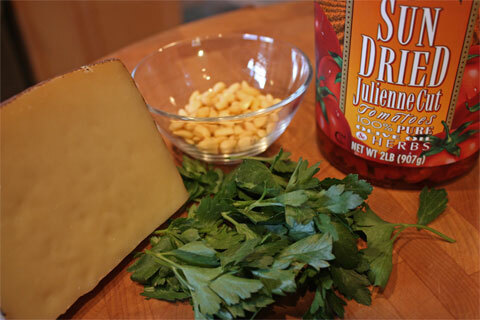 Love the idea of using Manchego in your Mornay sauce. Sounds awesome!